This warm, overcast and breezy day is beautiful. Good fellowship is all around us as the members and Chris Gibson RN enter the room greet and form into conversation groups. 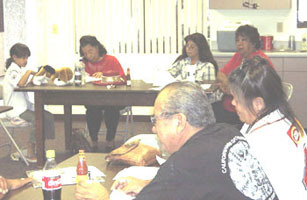 TONKAWA President, Esther Abrahano and granddaughter Margaret chaired the meeting. She opened the meeting at 12:10 with a prayer in Choctaw and English. Jane Dumas, although out of town, had asked Chris Gibson to be a speaker at this meeting. Last month there were many voices sharing their experiences and knowledge over Cancer and how it affects families. 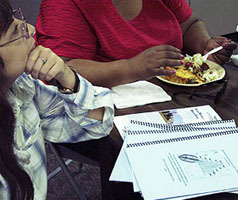 Excellent healthy food brings smiles to the TONKAWA membership. Jerry Starns, our resident chef, prepared Sloppy Joe hamburgers! 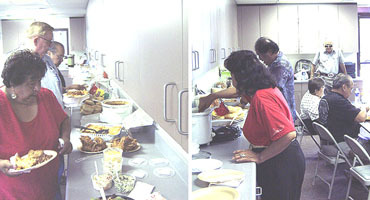 Potluck choices of beans, stew, fried chicken, Aye Carambra! Chicken enchiladas, rice and a wide variety of salads and spicy dressing. Loads of fresh fruit and big juicy grapes for summer diets. Our busy TONKAWA treasurer Vicky Gambala was in attendance and lent her support while guest speaker Chris Gibson was reviewing her handout for the group. Don Vingeualt, Santa Ysabel Ipai, and Jerry Starns, Menominee, are both cancer survivors and added their personal experiences to the discussion and presentation. Paul Razo listened to Elizabeth Stranfeld bumper bumping busting boo-boo and participated in discussions and the congeniality of the afternoon. 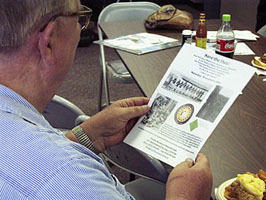 Jerry reviews the Warriors display and reception information presented by Roy Cook, TONKAWA Secretary. Announcements of Nov.20 and Dec. 18 community dinners, which TONKAWA members volunteer for each year, were brought to the members' attention. Sadly, Vicky Gambala again reminded us that CA Culture Days in Balboa Park is cancelled for this year. Marga Toha and Yvon faithfully support the TONKAWA presentations and discussions. Ben Nance came in and took all these pictures. 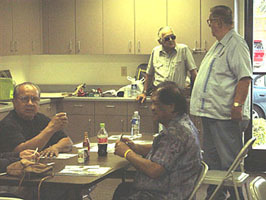 Maybe we will see you and a friend at the next meeting of the TONKAWA Elders: October 10, 2004. 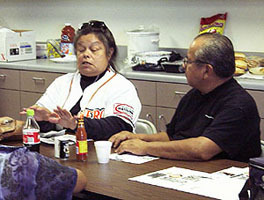 Our meetings are in the Many Nations: Chet Hunt Community room, 3928 Illinois St. San Diego, California.